We met Patrick at 9am to head out for the day. 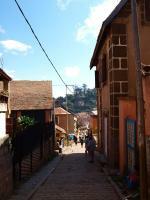 Before leaving town we took some time to explore the city of Fianarantsoa. We drove up to the highest point in the city to see the view and get a sense of the city’s extent. It’s quite large and is considered the “second capital” of Madagascar, presumably in case of an alien occupation of Tana. Fianarantsoa means “place of good learning” and has many colleges and universities. 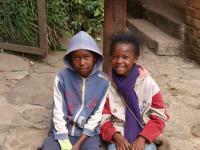 The children appear to be some of the most charming, well-mannered, and enterprising in Madagascar, if not the world. We met several of these young people during our visit to the city, all of whom had impeccable English (and were learning Malagasy, French, and generally at least two other languages in school). When we stopped at the overlook in Fianarantsoa, we were greeted by five such youngsters who welcomed us, introduced themselves, inquired if we spoke French, or perhaps English, and then proceeded to politely inquire how our trip was going, where we were from and what parts of their country we were visiting. They also wanted us to take a picture of them and gave us their addresses (both snail and email) so we could send them a copy. In addition, they had some small Malagasy coins that they were hoping to exchange for American coins for their coin collection. After all of this exchange, they did also add that they are students who “need a little job” in order to have money for “copy books” and other school supplies. They had made notecards with drawings of lemurs, boabob trees and other local items that they were wondering if we would be interested in purchasing. They had been so charming about the whole thing that of course we bought a few cards. We later ran into other children with a similar approach, but despite the fact that this approach was well practiced by many children in the city, it still came off as a genuine and sincere welcome. Fianarantsoa is built on a large hill, with the old city on the hill top and the more modern portion lower on the hillside. We walked through a portion of the old city and stopped for some tea (Sahambavy - grown a couple train stops away) at a small cafe. We found a batik shop in old town with lovely wares. At the top of old town was another great spot for views of the city. 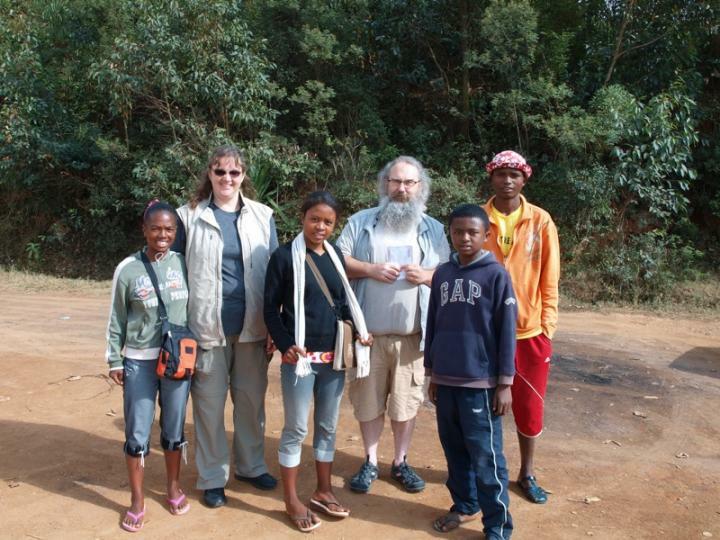 After our tour of the city, we headed south again and began our 206 km journey to Isalo. Similar country to yesterday afternoon, though today was less windy (portions of yesterday were reminiscent of Maui’s “road to Hana”). Many terraced fields, lots of red clay and many small brick/clay houses. Stopped in Ambalavoa for lunch followed by a visit to the Antaimoro Paper Factory, where we were shown how, using the bark of a Malagasy tree (strangely not local to this area), they make all sorts of paper products. Some are quite decorative as they often press flowers and leaves into the paper as it dries. We picked up a few envelopes for use in Power Grid as wallets. After lunch we drove out of the mountainous area around Fianarantsoa and into the plains - wide open spaces with “massifs,” large rock formations that dominate the landscape. We are now traveling out of the highlands and into the semi-desert areas of the south, reminiscent of the American West. The massifs include the “bishop’s hat” and the “three sisters.” At the base of the three sisters is Anja Park, a community run reserve that came about in the last decade because the local people wanted to preserve the area and local lemurs and thought a reserve might provide a means of employment for some of the local people. We spent an hour or so at the park with a local guide who took us to see the beautiful scenery and some of the roughly 300 ring-tailed lemurs that live in the park. We got good views and our guide was knowledgable. 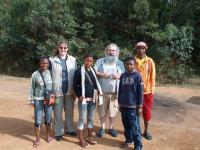 He took us to some of the rock caves that the local tribe (Betsileo) have used as a place of refuge in the past. Our guide was also barefoot, as many Malagasy are, and it was impressive to watch him tread on the rough path with seemingly nary a care as to where he placed his feet. Obviously, if you go barefoot your whole life, your feet get pretty tough. Even knowing that, I still found myself marveling at his ability to go barefoot in such terrain. We arrived in the town of Ihosy (about 90km north of our days destination) in late afternoon. We stopped in town for about 20-30 mins to wait for another couple of cars to meet up with us so we could all caravan to Isalo National Park together. The next section of road is dangerous - prone to bandits. As it was beginning to get dark, it seemed wise to travel in a group, rather then individually. As we waited we talked with some local kids who were collecting empty bottles (we gladly gave them ours) and were hoping for money or candy from us (no luck there). Containers are precious in Madagascar, and although a real recycling effort as we know it in the States is not present here, things are reused repeatedly before being thrown away. Bottles refilled with water, tea or other liquids show up at every road-side stand. Much of the clothing we see worn are apparent castoffs from America and Europe. I've lost track of the number of “University of Michigan” and NFL shirts and sweatshirts I have seen, also plenty of Disney Princess and Pixar Cars emblazoned clothes and backpacks are in evidence as well. Conservation is clearly an issue here as well, largely due to the difficulties of getting electricity and clean water. Many places here struggle to have these available. Some of the hotels we have stayed at have limited hours electricity is provided in an effort to cut down on environmental impacts and, of course, costs. The last stretch of road was definitely the most tense we have experienced, as we were all conscious of the potential for bandits, though we probably had no idea what that really meant. At any rate, we could see that our driver and guide were much more conscious of what other vehicles were around. Thankfully, nothing actually happened, other than the stagecoach hold-up we witnessed. Once we reached our hotel, the Isalo Rock Lodge, it was a bit like arriving at a resort in paradise or perhaps old Vegas. 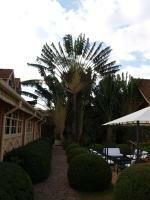 We were greeted at the door by staff bearing refreshing fruit juices and warm towels to wipe off the dust of travel. Certainly very welcoming.